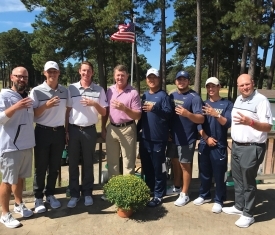 The Salute Military Golf Association and the George Washington University Men’s Golf Team have come together to create the Warrior Tribute, a season-long campaign to honor all of our Warrior Golfers. 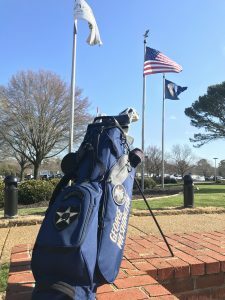 A group of veterans actively taking part in SMGA events will have items of significance to them placed on a golf bag that GW players will carry at all of their tournaments this spring. The bravery of these wounded warriors shines through their service to our country, and in how they live their lives today. It is our privilege to share their stories with you. Every soldier’s story has a different theme: bravery, selflessness, commitment, unity, and a host of other noble messages. The journey of CW4 Brent South should be defined by redemption. Over and over. South joined the Army in 1989 as an infantryman, the beginning of 21 years of service in the Armed Forces, and like many others, he found his calling as a last resort. He became a part of the 2nd Airborne Division, was assigned 1st Ranger Battalion, and by chance, took part in Operation Desert Storm, an experience he described as “once-in-a-lifetime.” After Desert Storm, he submitted a warrant officer packet and completed flight school. He deployed around the world and flown thousands of hours in different aircrafts, achieving a great measure of success for a man who had few expectations at the outset of his military career. Between peaks there are valleys, however, and on June 12, 2004, he hit bottom. The bottom of the Tigris River. His aircraft was accompanying a ground convoy outside of Taji, Iraq, when it lost an engine, hit a tree, and ended upside down in the water. South says the accident felt like a car accident, if his car had been hit by three 18-wheelers, one after the other. He sustained facial lacerations, traumatic brain injury, and a host of other bumps and bruises. To top it off, he took two more direct blows to the skull on the way to the emergency room, when the Humvee door hit him during the drive to a medevac, and when the medics dropped him off the stretcher in their hurry to get him and his co-pilot to safety. South can laugh about it now, as it sounds like an episode of M*A*S*H.
It still bothers him today, but he has a cure: golf. He benefits physically and mentally from the activity and camaraderie the sport provides, so he’s on the course every chance he gets. His reintroduction to golf started in 2015 when he contacted the SMGA. Though he had been a near-scratch golfer prior to the crash, he didn’t pick up a club for 10 years following his injury. The goal was to relearn the game by adapting to his new limitations, and with the organization’s help, he has. Like every American Golfer Program participant, he completed a series of adaptive golf lessons, received a new set of clubs, and found some courses happy to accommodate him. Days on the links with good company and conversation calm his panic attacks, but he’s even more aware of the positive effects the game has on others. He believes that one day on the golf course has the same effect of six months of PTSD counseling, and while a doctor might not agree, the statement realizes the mission of the SMGA: to aid rehabilitation and improve quality of life. Golf has been a part of his redemption, and our organization is proud to have empowered him with the sport. South will continue to practice and improve his golf game, and in turn, calm the effects of his TBI. He’s climbing once again towards a peak, as he’s about to earn his Bachelor’s in Business Administration and Marketing from the University of Ashburn, and working on several patent ideas at the same time. The GW team honored South last week at the William and Mary Kingsmill Intercollegiate, finishing tied for 10th out of 24 teams, and the retired warrant officer sent the golfers his 1st Ranger Battalion patch to add to the growing number of personal effects from our tributes from the fall. The Warrior Tribute bag will continue its journey around the country this spring, culminating in the Atlantic 10 Conference Championship in Orlando. The SMGA serves hundreds of post 9/11 wounded and injured veterans and their families. Please, help us achieve our mission to provide rehabilitative golf programs, experiences, and family inclusive golf opportunities for post-9/11 wounded war veterans in an effort to improve their quality of life. For more information, please visit http://www.smga.org/online-donations.